I'm sure we're all aware of the craze that's been going on for a while now over argan oil, dubbed as the "thousand year old beauty secret". In Hollywood, it's adored by celebrities such as Eva Mendes and Marian Cotillard, and in demand hairstylists like Orlando Pita use the wonder product to bring life and shine to tired hair (1). The Argan tree (scientific name: Argania spinosa) is known as the “Tree of Life” among the people of the Moroccan Berber community and its oil, extracted from the kernels, is now considered one of the rarest and most expensive oils in the world. Though used by women living in the harsh and arid environment of Morocco for hundreds of years to protect and nourish their skin and hair, it has recently gained popularity in the West and dubbed as a “miracle ingredient”. With its high levels of Vitamin E and composed of more than 80% fatty acids, it is used for everything from healing skin ailments to preventing premature aging. It is also now being utilized as a safer alternative for caring for baby’s skin or for those with extremely sensitive skin. Pure argan oil, a powerful product that delivers so many benefits, does not come cheap as you may expect. I've seen tiny bottles that can literally fit in the palm of your hand go for over $100 each. Sadly, many of us simply cannot afford to shell out that much even for such a great product that will certainly yield positive results. 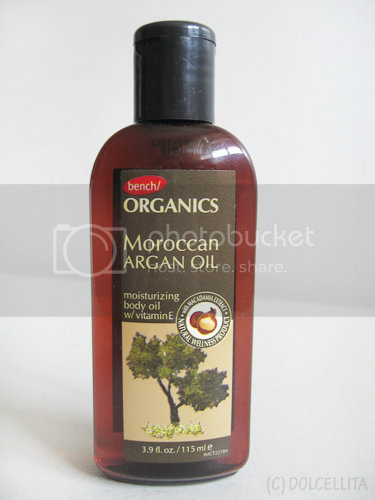 However, Bench has given us a great and affordable alternative with their Moroccan Argan Oil from their Bench Organics line! Though not made of pure Argan oil, which is why it's affordable in the first place, the product claims to still deliver a number of positive skin care benefits. It is completely multi-purpose and can be used for your face, hair, and entire body. The oil is housed in a conveniently sized plastic, tinted bottle. There's actually a reason that argan oil is stored in tinted bottles in the same way olive oil or even most beers are - the tint helps to block or minimize ultraviolet light which may deteriorate the liquid inside. The product is dispensed via a flip-top opening. Though the hole appears a little large, it actually releases a very controlled amount so you won't end up pouring too much out by accident. The cap is also quite secure and doesn't open too easily so I can deem this as safe enough to bring along with you in your bag if you need to. Moisturize your skin with this non-greasy body oil enriched with natural extracts, moisturizers and antioxidants. ARGAN OIL is extracted from the fruits of the Argan Tree (Argania spinosa), which are harvested from the lush forests of Southwestern Morocco. Argan Oil provides proper skin nourishment. MACADAMIA OIL seeps into the skin and helps retain moisture. VITAMIN E has the natural ability to make skin smoother and healthier. Directions: Apply on face, hair and all over your body. For best results, use after bath or shower. INGREDIENTS: Cyclopentasiloxane, C12-15 Alkyl Benzoate, Oryza sativa (Rice) Bran Oil, Argania spinosa Kernel Oil, Macadamia integrifolia Seed Oil, Fragrance, BHT, Tocopherol. Again, it is the mix of different ingredients that makes this product affordable. If 'Macadamia integrifolia Seed Oil' was the sole ingredient, this one bottle would be priced much, much higher. Pure argan oil is supposed to be a golden-yellow color and have a "raw, green, nutty" scent (2). Bench's Moroccan Argan Oil is clear and its consistency is slightly thinner and more watery than that of regular baby oil. The scent does smell a little nutty, to me at least, but with obvious added fragrance. However, I really do love the smell! I use this product mainly on my face. I have combination skin, so certain areas of my face can get very dry, my cheeks and around my nose in particular. My skin is also temperamental, so for days when I'm especially dry, I apply this regularly on those areas that need it most just before bed every night. Depending on how dry my skin is, it's usually back to normal in 2-3 days. I actually had a severe reaction to a facial soap I tried a few months ago which resulted in my cheeks turning really red, sore, dry and slightly swollen. I was either allergic to a particular ingredient/s in the soap or something in it was much too strong for my skin. I used this oil in tandem with the famous Lucas Papaw ointment to help my skin recover and it did after a week and a half. My cheeks still suffer from semi-permanent damage as they're now more sensitive and are drier than they used to be, so I reach for this when they need extra moisture and for them to feel smoother again, even if temporarily. I also use this for the ends of my hair when they're feeling a little dry and it works great without making my hair feel greasy or sticky. NOTE: Just to cover all bases here, I know some people who are particular about argan oil would deem this as a "fake" because of a number of aspects such as the oil having the wrong color, scent, the fact that it's stored in a plastic bottle instead of a glass one, and so on. This site lists all the guidelines for spotting a fake. 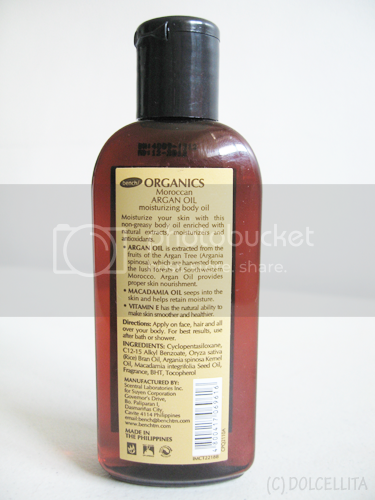 However, take note that the product does not claim to be 100% pure argan oil so it cannot be deemed as fake in any way. It does not hide the fact that it has added ingredients as well which many fake argan oil products do while still claiming to be pure. For a product that contains argan oil in the first place, I find it to be very affordable. It's stored in a conveniently sized bottle with a secure cap that doesn't leak so it's easy and safe to bring along with you if needed. 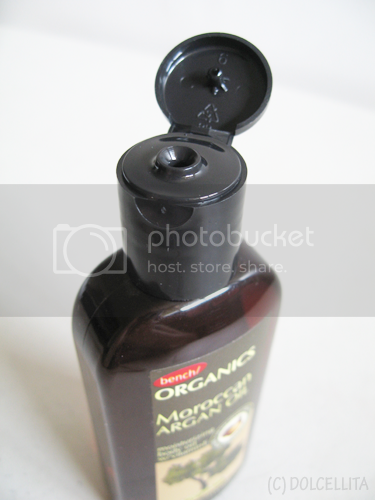 The bottle dispenses the oil in controlled drops so it's very hard to accidentally pour out too much. Highly moisturizing for both skin and hair. If used regularly, it can keep skin smooth and nourished and promote healing for the likes of skin reactions such as allergies, sunburn, etc. Like many oils, it takes a while to absorb fully into the skin. How long will also depend on both your skin and the surrounding environment. It's not ideal as part of my skin care routine in the day because of this so I only apply it at night. Though I do love the scent, it doesn't disappear until the oil is absorbed and if I need to apply quite a lot to my face, it can get a little overpowering sometimes. I didn't know that Bench has an Organics line! I've heard a lot about the wonders of argan oil. I've tried one from a different brand once. I don't know why I didn't keep on using it. I'm not sure how long the line has been around actually, but I'm sure it's fairly recent. I only tried argan oil before and used it on face too..not sure what is the results but the texture is not oily as expected.. Thanks, Chai! Argan oil started becoming a beauty trend a couple of years ago, I think. But people are definitely still raving about it! is this also good on hair even it is not reallty 100%? Founded and imported by a Moroccan in Malaysia, Argan Amazigh Oil is 100% Pure &Organic Argan Oil.Mr Mohamed Nassiri knows very well the people and region that produce Argan Oil back in his hometown in Morocco. Hence, he brings only the highest quality of Argan Oil to the customers. ◦Reduces blemishes and slows down the appearance of wrinkles. ◦Helps protect skin elasticity. Moisturises dry skin. ◦Reduces visible scars left by acne or chicken pox. Can reduces acne and skin inflammation. ◦Restores the shine of dull, lifeless hair. ◦Promotes scalp care to advance hair growth & prevent split ends. ◦Elevate skin condition like psoriasis and eczema. ◦Soothes rheumatism & arthritis pain. Argan oil’s various laboratories testing outside of Morocco were able to discover its true value. Scientific research and studies have proven the sworn statements of the people of Morocco who have been using Argan oil for centuries. Highly rich in vitamins E and F, fatty acids, squalene, antioxidants, carotene, phytosterols, and phenolic compounds, argan oil was clinically tested and proven to be quite miraculous indeed. 1. Argan Oil and Dry Skin: Its active compounds are essential for a healthy and hydrated skin and scalp. 2. Argan Oil & oily Skin: Regulates sebum production to keep the skin’s natural oils at a healthy level. And the skin does not look and feel oily any more. 3. Argan Oil & Irritated and Itchy Skin: Soothes the skin and alleviates itchiness brought about by dryness, allergies, or other skin conditions. 4. Argan Oil & Acne and scars: It is effective in controlling the production of sebum. It prevents redness and inflammation brought about by acne. Also helps in reducing the appearance of ugly scars left by acne. 5. Argan Oil against Ageing: It helps to stimulate the renewal of skin cells, making the skin more elastic. It effectively reduces wrinkles and rehydrates dry and damaged skin, helping to reverse ageing. 6. Argan Oil and Stretch Marks: This oil is also perfect for repairing skin elasticity & discolouration brought about by stretch marks. 7. Argan Oil for Treating Eczema and Psoriasis: The unique blend of nutrients found in argan oil greatly helps in alleviating the inflammatory symptoms associated with psoriasis & eczema. 8. Argan Oil on your Scalp and Hair: Nourishes and protect the scalp keeping it healthy and dandruff free. 9. Argan Oil for Your Nails & cuticles. 10. Against Oil & Sun-Damaged Skin: The high concentration of vitamin E found in argan oil will protect the epidermal layers of the skin. This will repair and protect skin from various stages of UV light damage. 11. Argan Oil for Superb Massages and Rheumatism. Now Moroccan Miracle Oil under brand of Argan Amazigh Oil in Malaysia with affordable price! WHERE CAN I BUY THIS PRODUCT IN SINGAPORE? I don't know if they'll have this specific product there, but I do know there is a Bench/ store in Singapore. Unfortunately I'm just not sure where it is there.